Wonder of wonders, I managed to upload all my photos from our Las Vegas trip that we took two weekends ago and am getting around to write a blog post about it! So yes, we had a great time. We stayed at the Planet Hollywood hotel, which was nice; I liked the slick, mod feel. Our room had props and photos from the movie Tank Girl . 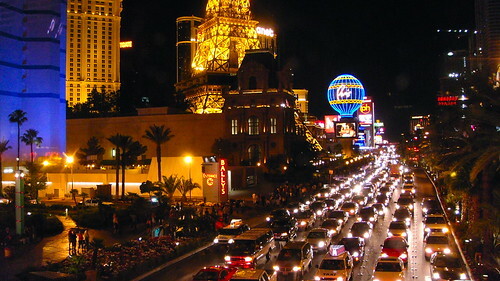 Our room faced The Strip, but our direct view was of a roof below and construction across the street. If you craned your neck to the right, you could see the Bellagio. Speaking of the Bellagio, after unsuccessfully trying to get into Olives without a reservation, we ended up having dinner at Sensi, and it turned out to be fabulous. We had a prix fixe dinner: I chose crisp fried shrimp, Kobe flatiron steak, and “chocolate temptation” (layers of milk chocolate, nuts, and praline, with salted caramel ice cream). Yum! After dinner we saw O , one of the Cirque du Soleil shows, and it was amazing. The only thing I knew going in was that it was performed in and out of water — I was thinking a see-through tank — but it’s more like a pool that takes up the entire stage, with the shape and depth constantly varying with each scene. I loved it. On Sunday we had brunch and went window shopping at the Miracle Mile Shops, the mall adjoining Planet Hollywood. In the evening we had dinner at Olives (with a reservation this time). I have to say, I wasn’t quite as impressed as I was the previous night at Sensi, but it was still a great meal. I had a prix fixe of butternut squash tortelli, paella “olivacious,” and chocolate falling cake. Then we saw another Cirque show, Mystère , which is at Treasure Island. This is more of the big-top circus show that I’m used to, and our seats were pretty close to the stage, so it was thrilling. Monday was our last day in Vegas. 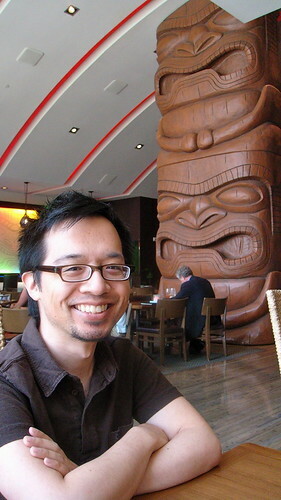 We had lunch at Trader Vic’s — you knew we had to work tiki in somehow, right? I don’t usually have a cocktail with lunch, but hey, it’s vacation, as if I need an excuse. We shared a tiki bowl, and I had Kahlua pork sliders. Tasty! Then walked next door to Paris. (The Strip lends itself to time-space transportation, doesn’t it?) We had a coupon for the Eiffel Tower Experience (though “experience” is overstating it; it’s an observation deck), so we went up to the top of the fifty-story tower. It has some great views of the area. But just as we got up there, it got all windy and hazy, so it wasn’t ideal viewing. We spent the rest of the afternoon shopping, and before we knew it, it was time for our flight home. We had taken US Airways there, and our favorite airline, Virgin America, on the way back. We upgraded at check-in and made our way to the gate area, where Thom noticed celebrity chef Tyler Florence! As we got in line to board, Thom addressed him as “chef” and said hello. Heh! And onboard he ended up sitting in the row across the aisle from us. We remembered that Virgin has started serving absinthe (Le Tourment Vert), and we had to try it. Our flight attendant recommended mixing it with club soda (or lemon-lime soda), so that’s what we had. I have to say, I’m not a fan of licorice taste, so it wasn’t my cup of tea. But it’s nice that they offer it. They have it for a limited initial run, but I wonder if it will catch on enough for them to keep it. Our flight attendant was real nice and even gave each of us a mini-bottle to take home! So yes, we’ll definitely have to plan another Vegas trip soon. It’s just not the same being back on our street with no hourly fountain, volcano, or pirate show to entertain us. It’s so quick to get to (by plane, at least), and there are a billion more Cirque shows to see! At least it seems that way. Oh, and yes, we did gamble, but we’re such low rollers. I mostly played video blackjack and lost a few dollars. That’s enough action for me! 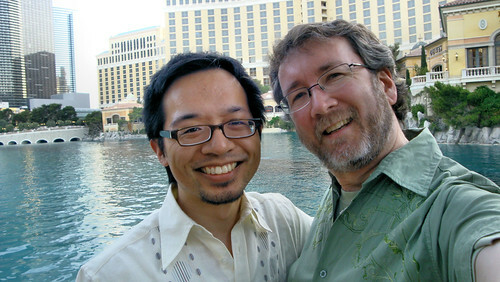 My pics are on Flickr in my Las Vegas set; see also Thom’s set. The drive down Highway 1 is so pretty and Half Moon Bay has a bunch of cool little restaurants, but I often forget how close it is, only about twenty miles from Daly City. We definitely need to go down there more often (in addition to the pumpkin festival!). A reminder for foodies: If you participate in a Zagat Survey by rating restaurants or other venues on their website, you get a free copy of the corresponding printed guide when it comes out, usually a few months after the survey period. The San Francisco restaurant survey is now open through next Sunday, March 29, and the New York and L.A. restaurant surveys are also open. In order to vote, you need a Zagat account, but it’s free to register. I’ve done this for a few years now, and while there is always a lot of info out there on the web for restaurant research (hello, Yelp), it’s sometimes handy to have the little red Zagat guide. Last Sunday Thom and I ended up having an impromptu afternoon at a few westside San Francisco spots. We were looking for a place to have brunch, and we decided on the Park Chalet, which is just behind its more visible sibling, the Beach Chalet, on Great Highway. They have a buffet brunch on Sundays; I think my favorite thing was the crème brûlée french toast, yum. Afterward we went across the street to Ocean Beach and walked around for a bit, then drove up to the Legion of Honor museum, where we happened to arrive just as the weekly organ concert was starting. All great sights, so that means another video! And a few additional photos (map) are up on Flickr. When I tested the video with my focus group, i.e., Thom, he said the music for the Ocean Beach segment was “very 90210.” Ha! A couple of weekends ago we had some gorgeous weather, so Thom and I decided to go out in the afternoon. We had brunch at Nini’s, which was recommended to us by Espie. It’s a old-school coffee shop tucked away in a residential area of San Mateo. We’d heard good things, and Nini’s didn’t disappoint. I had an omelette and especially liked the home fries. Here’s a quick video from the counter. I love Thom’s expression. He’s like, “Are you recording? !” Oh, I kid. He’s such a ham. (Mmm, ham.) And apparently I cannot put together a video without adding stock music. Afterward we went to Coyote Point, the park in San Mateo that faces the bay and has a scenic vantage point for planes approaching SFO. Here’s another video, but first, a production note. I totally replaced the sound in the last few shots with sound effects from iMovie: jet flybys (because we had been talking inadvertently during that shot), and seagulls and waves (since the original sound was pretty weak). Though, it’s kind of funny; you see one seagull, but the sound effect is a whole flock. Ah, the birds! The invisible birds! Other photos are up on Flickr. We wrapped up the day with a trip to the nearby Peninsula Humane Society (which is where we adopted Tiki and Mojo over a year ago now) and had a nice time visiting with the animals. So cute.